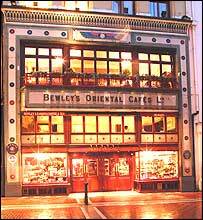 The owners of Bewley's Oriental Cafes, Ireland's famous tea and coffee shops have announced that two of their landmark Dublin cafes are to close. Many Dubliners are dismayed that the Grafton Street shop, used by writer James Joyce, and Westmoreland Street premises will close on 30 November. The owners, coffee and tea suppliers, blame running costs, the "coffee to go" culture and the public smoking ban. They say the two cafes are no longer profitable. Bewley's, established in 1840 as a coffee and tea import business, was bought by the Campbell family in 1996 and injected with a multi-million pound investment. While the coffee and tea products sold worldwide, the 3.5 million people who came through the cafes' doors in 1996 have since dwindled to one million. Bewley's company chairman Paddy Campbell says there are many people who love the place but also "a lot of people who say they love it but they didn't love it enough to put their hands deep into their pockets". He added: "People complain about prices, but they don't seem to understand the reality that it costs money just to sit here, just the cost of this place that I am sitting in, leaving aside the coffee." He described the decision to close as "a very emotional event, like a death in the family - it's like a part of Dublin dying." A Bewley's spokeswoman said Ireland's public smoking ban had also contributed, especially as a request for outside seating was rejected. "People who used to come in for a coffee and a cigarette don't do that now," she told BBC News Online. The BBC's James Helm in Dublin describes Bewley's as an old-fashioned institution, both a tourist attraction and part of the daily routine for many Dubliners. It is a quirky place on busy Grafton Street, with three floors and even its own small theatre, he says. He says that for staff and for regulars its closure will be the end of an era. The company plans to keep operating cafe outlets at Dublin Airport and in two book stores in Dublin and Belfast.